Click on a year to see a catalog of all the motorcycle models made that year. Then click on a motorcycle model to see technical specifications, pictures and riders' comments. Bikez.com's motorcycle catalog includes all bikes ever made. Please e-mail us if any bike is missing. 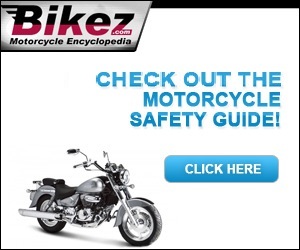 Bikez offers free ads with quality presentation of your bike. Click here to enter your ad. Help other bikers by rating motorcycles you know. Navigate to the bike and click the link to rate it. Bikez need 3 or more raters per bike. Bikez is working with registration of specs for veteran and vintage motorbikes. Old motorcycle pictures are very velcome. Navigate to the right bike, click the link under the picture and upload your image file. You can get your bike, name, nick name or web on Bikez.com.